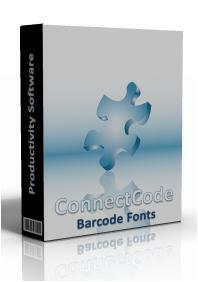 ConnectCode, a world leading provider of barcode software and fonts, today announced the release of a new version (v11.1) of ConnectCode Barcode Software and Fonts. This version introduces a new and powerful Label Wizard in the Barcode & Label app to ease the tedious steps of label creation with data stored in a CSV file, an Excel file or Microsoft's People app. 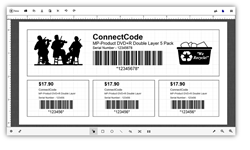 ConnectCode, a world leading provider of barcode software and fonts, today announced the release of a new version (v11.1) of ConnectCode Barcode Software and Fonts. This version introduces a new and powerful Label Wizard in the Barcode & Label app to ease the tedious steps of label creation with data stored in a CSV file, an Excel file or Microsoft's People app. The Label Wizard offers over 900 commonly used label templates including Price Labels, Address Labels, Inventory Tags, Business Cards and labels from well-known brands/vendors. After choosing a label template, the user can proceed to select the location of where their data is stored. This could be a CSV file, an Excel file or contacts stored in Microsoft People's app. Upon selection, the Label Wizard will automatically generate Text objects that correspond to the columns of the file or contact fields in People's app. This generated label is immediately ready for printing or can be further touched up with the full-fledged WYSIWYG label designer. The latest version of Barcode & Label also supports applying functions to imported data. For example, functions to round a number, format to a currency or pad characters are supported. It is important to note that different countries use different ways to format numbers. For example some countries use a dot to represent a decimal point while some countries use a comma to represent a decimal point. For currency, besides different currency symbols, different countries have different requirements such as the number of decimal points and the placement of the currency symbol. Barcode & Label adopts an in-depth approach of supporting all the different variations through a simple and elegant Location setting. Barcode & Label is available as part of ConnectCode Barcode Fonts and Software package and can be downloaded from Microsoft Store. 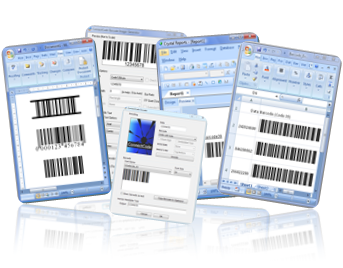 Barcode & Label also supports printing of standards compliant barcodes through ConnectCode's award-winning barcode fonts engine. A Mac version of the barcode fonts is also available for companies on a hybrid environment that uses both Windows and Mac. For enterprise users, a silent installer is also available on request. Barcode & Label app requires Windows 10 or onwards.